All our fields are on several agricultural management programs including a strict Weed Control Program and consistent Fertilizer Program. 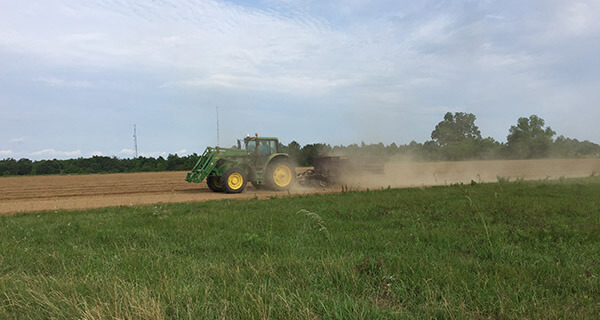 Our soils are also laboratory tested on a routine basis to ensure optimal soil qualities producing superior hay quality. From fantasizing about their own farm to founding Rockhill Farms, James and Jessica Rockhill have spent their lives fostering a passion for farm life. Familiarize yourself with farm life and learn about the latest farming techniques and industry trends. Welcome to the farm! For years, James and Jessica Rockhill had a dream of owning their own farm one day. In 2015, the Rockhill’s were truly blessed by the opportunity to settle down in Molino, Florida. Since then, the Rockhill Farms’ story has been filled with journeys of dedication, success and blessings. We just baled our Bahia fields for the first time this year! We have over 1,000 bales priced at $5 per square bale. Don’t forget that we do have Perennial Peanut Hay. This high-quality hay is priced at $8 per square bale. For a limited time only, ALL HAY IS $1.50 OFF PER BALE! Stop by today while supplies last! Hay Update !!! We are Sold Out of Pensacola Bahia! Sorry for the inconvenience... we will have plenty more this hay season ! !